Working for a more Abundant Future today. A topic that I keep seeing come up more and more – thanks NatGeo! – is how crazy you have to be to be a prepper. Where is your bunker? Gas masks? Is your IQ higher than your shoe size? What most people don’t seem to understand is that most of us (oops, I’m using a broad brush too, but at least I’m informed) aren’t preparing for the end of the world. Sure it is part of our assessment and actions – but it’s not the end all or be all. Here at Abundant Future we do prepare for those high-impact but low frequency events, but our main purpose is to live a better life and to be self reliant and agile enough to prosper no matter what the future holds. We do prepare for natural disasters, personal disasters, or just to have a better life today through self reliance and personal productivity, but we don’t sit in a bunker on top of a stack of cans waiting for the world to end. Now for the juicy stuff – the world IS going to end. Depending on the experts you listen to it is between 2.7 and 8 BILLION years away. That is the estimated timeline for the Sun to expand enough to cook off every living organism on the planet and then go supernova, incinerating the entire planet in the process. I’m not preparing for that, I think that will be up to my great^10000 grand kids to prepare for. No matter what happens even if we are hit by a mega-solar storm, or have full on nuclear war, or face a pandemic like no one has ever even thought possible; life will go on. People are resilient, so lets look at the big picture, get some perspective and start working towards a better life every day. Just so you can better visualize what is going on, pop over to this link and take a gander at what time really is. The new smash hit – Doomsday Castle – is taking the prepping world by storm! It has got to be the best, most informative and most entertaining show on prepping I’ve ever seen. No that isn’t sarcasm! The spectacle continues as the drama keeps unfolding – in the lot of them there doesn’t seem to be a want or will to do anything other than be famous and cash in. (The only exception could be the eldest sons weird obsession with wanting to prove himself) The next reality TV star family is here and they want to give the Kardashians a run for their money, showing how dysfunctional and crazy they can be. As sad as it is to say I’d bet money that within a year at least one of the kids will be featured in some racy video/photo op to make money, ala Kim Kardashian. In the midst of the side show and the many horrible prepping atrocities there are a few neat nuggets to think about, but mostly it is a great method to learn how NOT to prep. Going back to the original Doomsday Preppers episode that first highlighted the castle they stated he had already spent over a million dollars building it. Hopefully that was about 900K invested in the land and maybe the last 100K being foolishly spent on the castle itself. Even then I am not too sure he got a good deal for his money. A drawbridge is too heavy and overbuilt. It might stop a car the first time, but I’d bet a few blows from a sledgehammer on the lower attachments and it would come down. A catapult. Catapults were used against fixed fortifications (like a castle…) or massive quantities of attackers. It has zero utility as a prep, but just might break apart and hurt someone. A portcullis with a murder hole. You have to have a strong backup for your overbuilt drawbridge – never mind the windows big enough to drive a semi through that are wide open. You have to be dutiful and wise with your time and money – these are good examples of what not to do. Instead how about a prioritized list of what you can spend your time and money on, not what is cool or fun or will get you noticed on TV. Don’t spent time building a catapult and portcullis when you could be putting up a roof, walls and windows. Or reinforcing the small livable space you do have – your windows looking outside are so crummy that water was leaking through as it rained. How is that supposed to be secure? So if you are going to prepare for ‘the end of times’ (what is that by the way?) you might want to give this show a chance and learn what not to do. A review of The Wayward Journey is up on Survivalblog! Practical Parsimony’s comment was selected randomly from the comments on the Live a life worth living introduction, and a $25 Amazon gift card is waiting in her inbox! Thanks to all who participated! I’ll have another post and contest up soon! So we are supposed to live a life worth living… Why? Now that is a basic question that is very easy or hard to answer depending on your viewpoint. You will have to figure out your own “why” but I’ll suggest a few reasons: It’s God’s plan. You deserve it. Your family and friends deserve it. The world deserves to be full of people who feel they have meaning. And countless other reasons, pick your favorites. My simple answer – every life is worth living. No matter how bad you think things are, or no matter how bad you think things might be – you, everyone, has a purpose here on this earth. If you don’t think you have a purpose here on earth, please seek help immediately. Ok, now that we’ve completely glossed over the “why” at a philosophical level, let’s dig into the why at a strategic level. You can group/ungroup or add as many as you like but I’ll use these as a starting point. You should have a reason to live, something(s) that bring you pleasure, that you are proud of. By now I’m sure some of you are asking “what does all of this have to do with survival and preparedness?” My answer is: Everything. Followed by a question back to you: Why do you want to prepare and survive? I’m guessing that most of your answers will correlate back to those buckets above. It’s just a thought process to see “why” you are really preparing. It’s not to survive the zombie hordes. It’s so you can survive the zombie hordes and see your children grow up in safety. Or the goal is to survive and help your friends, community, and church prosper. Or to provide compassion and aid to as many people as you can. The disaster or calamity that you are preparing for can’t be a why in and of itself. If you don’t know why you are preparing and why you want to survive I suggest you really think about the core drivers for your actions. All too often people get too caught up in food storage or tactical training, or sometimes people just ‘phone it in’ and buy the designer multi-year food packages without ever really knowing why. It is really easy to get caught up in that rat race, but we aren’t going to be a part of that, we have a purpose for everything we do. Ok, so I know why, what now? You have your reasons why? All of them? Some? A few? Write them down, as many as you can think of with as much detail as you can. Done? Now for a fun exercise: pick the 2 or 3 most important reasons and highlight them somehow. Next pick the 2 or 3 you wish you were doing better in and highlight them somehow. Don’t feel bad if those two groups overlap, after doing this exercise with a few dozen people about half the items highlighted fell into both categories. So you’ve got your most important reasons why. Now figure out what can you do today or tomorrow at the latest to improve, even if only a tiny bit, your standing in those areas. Just do it. Don’t think too hard about it. Do it. Go to church. Call your daughter. Go for that walk in the park. Do something nice for your spouse. Just do it. Ok, enough for today, I’ll have the next installment on ideas of how to live a life worth living up in the next day or two where we will jump into each of those buckets in detail. I hope you like this series – if you missed it please jump over to the introduction and leave a comment to be entered to win a $25 Amazon gift card! And remember: You can’t stop living life. You can’t let any one thing consume your life. You’ve got to live a life worth living. What is all the preparedness, self sufficiency, community building, gardening, etc, all about? Why do we work so hard to help ensure survival? Everyone’s answers will be at least a little different. But the core should be very similar, hopefully at least. To survive and live no-matter-what. “We had a ceremony today. An award, to the kid who caught the most rats this week. And we can look forward to that for the rest of our lives. To our kids growing up as rat catchers and swine herders. Honorable work. Needed work. Nobody puts it down. But … Don’t we want to hope for something better?” Rick Delanty, from Lucifer’s Hammer. How about we change the answer to: Survive and live a life worth living. How do we distinguish between the two? How do we work towards surviving and living a life worth living? First you have to start living a life worth living right now, today, this very instant. How? You will have to ask your self many questions, such as: What is important to you? What isn’t important to you? What is your quality of life, and the quality of life of those you love and care about? I could keep going, but you get the idea. I’d bet you didn’t even need me to tell you any of the above, and could name a dozen more things to add to the list. It’s those types of things that make people want to get prepared in the first place, if right now is so bad – what is the future going to look like? Today is bad, so we prepare for a worse tomorrow. But I think we should turn that right around and flip it upside down. Today is bad, how can we make it better so we’re looking forward to a better tomorrow? And more, if I don’t list it please let me know what you would like to see added! If you haven’t heard, our national debt (for those readers in the US) is stuck at $16,699,396,000,000.00. It has been sitting at that level for almost 60 days now. No we didn’t stop borrowing money, we have borrowed many billions of additional dollars over this period but the treasury is playing different games and books are being cooked. Pretty soon the game will be up, although it might be weeks, months or even years. I, like many others, never thought the game could go on as long as it already has – so who knows how much longer they can keep it going. How does this and the ever foretold, but never carried out, end of quantitative easing affect the average person? Negatively. How will it affect the average person? Rise in interest rates? Inflation? Deflation? Recession? D-d-depression? The answer is simple; yes. Will we see hyperinflation? I doubt it, as do most economists. Even the vast majority of doom and gloom – perma bear economist don’t see hyperinflation. Though high inflation or stagflation just might be part of the plan. But no one (except for that .01% who are changing the rules of the game) will know for sure when and how it will play out. You also don’t know if you will have enough to make your already necessary payments. Or if you’ll have a job. Or if you’ll be able to afford gas to get to work. Or. Or. Or. If you need help I highly suggest Dave Ramsey’s book! Lastly, get in shape, get healthy. Our healthcare system is a huge behemoth and is already about to topple and I believe it will be one of the first casualties in the next wave down. Lose weight, exercise, eat right. If you are on daily medications do everything in your power to limit your need. Almost all ailments can be reduced if you get into good shape. From diabetes to blood pressure to depression, eating right and exercising can help dramatically. There are a million other things you can do, but these three are the most important. Heck everyone should be working towards these three anyway! Everybody always talks about owning the night, and it’s a pretty easy concept to understand. What people generally mean when they say owning a night is that they are in control and those opposed them are powerless against them. In prepper circles this usually means that they have night vision devices to allow them to see at night or other setups, usually some sort of technology, that help give them a great advantage in the dark. While it’s all good and fun to talk about this concept, and especially the gear, it’s not always easy to get accurate and unbiased information. I’m not an expert and have never used any of the devices going to talk about here in a sort combat heart use application. So take it as a good explanation of why did what I did. Start out I’ll break the topics into four groups the first three of which are technologies and the fourth is a tactic, you can use all of these technologies and tactic in conjunction or independently. More is better, and always remember the role “one is none, and to his one”. The three technologies I talk about are A. Light B. Light amplification (NVG/NVD) C. Thermal imaging (FLIR) the tactic is just passive and active alarms and monitoring. Light: pretty simple, flashlights, candles, floodlights, flares, glow sticks, fire, and many more. This can be somewhat counter-intuitive, if you’re using lie you don’t necessarily own the night because using light will also aid anybody else, even those who you don’t want to aid. It should not be overlooked however because if you control the light you control that portion of the playing field. And that control can be the difference between winning and losing, or noticing and not noticing. Everybody should have many sources of light with several redundancies, but even if this is your strategy in any sort of grid down situation light discipline is a must. Practicing light discipline in doing a “light audit” to see where light can be seen and can’t be seen are both important projects. The last thing you’d want to do is to be signaling people “hey look at me!” By having light and a power when nobody else does. Why? Because I can only recommend, based on my research and observations, GEN 1 and GEN 3 units. GEN 1units are the cheapest and generally least effective, so why would I recommend these? Because they’re the cheapest. And because they give you a great bang for your buck, if you get a good unit. I personally have two GEN 1 units made by Yukon, and for the price they work great. Many people say to stay away from these kinds of things and only go for the PVS 14 military grade hardware. But like many others, I can’t afford to spend that kind of money on hardware that we hopefully will never have to use. After doing a ton of research online and testing out a few different options I ended up on the monocular version from Yukon, although some of the versions from ATN were also very good and highly rated. If you go this route I recommend a monocle over a binoculars and also recommend something without magnification. It’s much easier in my experiences to walk at night with a monocle using a “take your path, then walk it” and it is with binoculars and working with magnification is always a little trickier than not. GEN three units,specifically those that meet the PVS 14 designation, are high-end and usually military grade equipment. These are definetly worth what it costs but at $2000 or more per unit it does cost a lot. There are many people selling these, if you are looking to spend the money most of the reputable dealers will be able to point you in the right direction without too much hassle. I feel there is a lot of bias out there towards the GEN 3units, especially by those who have used them for actual tactical purposes. While I don’t have that background I do have a limited budget, unlike Uncle Sam and I need to make sure that I get the best bang for my buck. I also hope that I won’t ever have to use mine for anything other than walking, working or hunting at night. For those purposes it works very well! All of the other stuff, GEN 2 and Gen x+s and anything in between. I don’t recommend the stuff. Why? I personally tested a couple and saw no noticeable difference between them and the GEN 1 at least until I started getting in to the near/over $2000 mark again. If you are going to spend that much, go ahead and spend a little more to get the really good stuff. With GEN 1 I suggest getting ancillary infrared flashlights or floodlights to use with them and make sure that the device you get can have the IR light turned off. GEN 1 will allow you to walk and navigate easily, and aid in movement detection. Nothing like the GEN 3, but way better than nothing at all! Thermal imaging: Forward-looking infrared, FLIR, looking at a completely different light spectrum than you’re used to. These devices look at heat signatures, just like the Predator does. The best way I’ve been able to explain it is to point people towards classic Arnold Schwarzenegger movie Predator. Okay so maybe that’s not the best way, but it’s an easy one, and its a pretty fun movie too. A short and great FLIR vs. NVG example, although the limitations they are showing on NVG wouldn’t (or shouldn’t) be found on a PVS14, but would be an issue with gen 1s. These capabilities are what’s moving a handheld thermal imager to the top of my list of things about me, the very top. For the same price as a single PVS 14 I’ll be able to have my two GEN one monocle’s and a thermal imager. The tactic of alarms and monitoring: I just wanted to bring this up very briefly to help round out the discussion. If you are having some sort of problem or are afraid of some sort of problem; whether it’s two or four-legged creatures, alarms and monitoring solutions should be set up. Whether their electronic like a motion detector or electronic alarm, or if they’re just very basic can of rocks tied to a trip line. They should be used to help alert you to the breach of your perimeter. These help back up any other method you’re using and should always be used to that end. That’s about the extent of my knowledge, once again I didn’t say I was in expert, but hopefully what I put here and links to these videos that I’ve provided can really help you get up to speed and make a good decision. Not only are these tools useful in a prepper’s sense but they can be a lot of fun, if for when you get any of these devices I highly suggest going out and playing with them. Yes, playing. If you are so inclined I also suggest training and practicing, but sometimes you just need to go out and play with your toys. Speaking of that I just got a new knife back from Cassel knives here in Indiana, handmade by a true craftsman and I’m going to go outside and play with that. Hopefully I won’t be playing with my first aid kit too. Over the holiday weekend I picked up a copy of Zion Preppers An Introduction to Prepping and a Guide to Fire and I have to say I thoroughly enjoyed the content of this book. The book is broken into two main parts, as the title might suggest. This part of the book explains in thought provoking ways Zion Preppers philosphy, tenets and reasons for prepping. Even after reading dozens of similar books, thousands of articles, and being a prepper for going on 6 years now, he was able to break down a lot of logic into very simple to understand ideas that helped expand my understanding of what prepping is. This is the part of the book that really shines! It is an A-Z survival fire handbook and would be a great addition to anyones survival library. You can find a lot of the information goes along with the YouTube videos he has posted Fire Videos but with easy to follow instructions already laid out for you. This will come in handy as both a learning/training aid (I can’t wait to start making a fire piston from his blue prints that are included!) and also as an invuable resource should a crisis ever arise. Instead of hunting, printing and collating a bunch of different articles I now have a one stop, neatly and professionaly presented source of information. 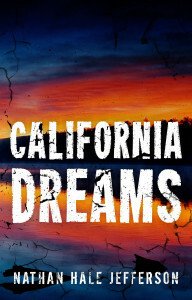 Alright everyone, you can now buy copy of California Dreams on Kindle for .99 (sorry, I had to take it down from the website in order to take part in the Kindle Select program.). California Dreams tells the story a veteran named Mike during a life threatening encounter in the national forest of California. As he fights for survival a timely visit from a friend could be the only thing that saves him. This is a short story (~25 pages). You can find it at http://amzn.to/13TT1Zm or click the image below. several celebrities and figure heads liked to proclaim this year. Read the first 16 chapters free! Copyright © Abundant Future Media | Auroral Theme by CMS Developer Web. | Powered by Wordress.